A trench has been dug and 130 metre 16mm 3 phase cable has been laid from the ESCOM (Malawian electricity supply company) supply station to the new x-ray room. A new darkroom for processing x-ray plates has been installed and lead-lined doors have been fitted to the building. Keith Feay has now arrived and is busy installing the x-ray equipment and training local staff in x-ray maintenance. One of the major issues at Embangweni is the water supply to the houses for nurses and others around the hospital. The cause of the fault was uncertain, several suggestions having been made. After investigation, the pump was lifted from the 60 metre deep well and was found to have failed. 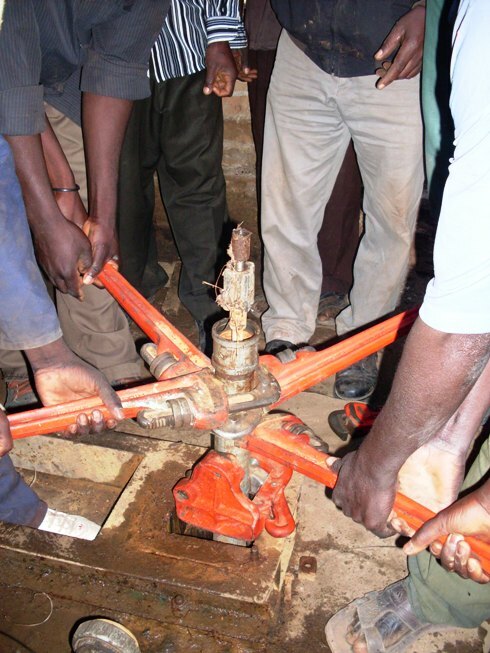 A specialist company in Lilongwe has refurbished and overhauled the pump and it is now working well, providing over 100% more water to the tank system. The nurses and other residents are very happy ! 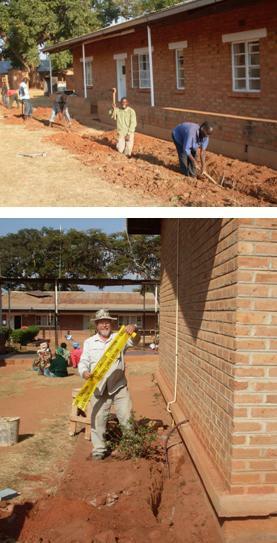 Dave Thompson and John have spent time servicing various pieces of equipment at the David Gordon Memorial Hospital in Livingstonia. The oxygen concentrators have been checked for oxygen flows and new filters installed. Duncan McNair’s Toyota Hi-Lux has been repaired and the engine rebuilt. It passed its COF (African MOT) and is running well. It will be of great assistance with the next building project with PHC. A copy was given to a police officer who stopped John to learn more about the Raven Trust’s work. He was thrilled to be given the Bible and promised to read it every day. John is confident that he will keep the promise. 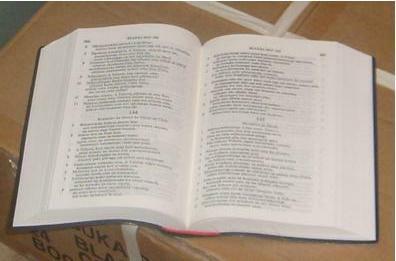 Another Bible was given to a man who was welding a small hole in the radiator and asked for prayer and encouragement. As John says – people matter more than things…..
A monitoring visit was undertaken to Jumbo to see how the ploughs and bullocks provided were used last growing season. The community was very excited – not only have they been able to increase field production, but thay have also been able some other families with ploughing and with the income thus earned they have been able to buy pigs…. They want to plant soya beans next year in the increased acreage and this will have the great benefit of providing and fixing nutrients in the soil. They currentlyhave a broken water supply which is unlikely to be repaired for some time and have dug a hole, or scrape, to collect water. Discussions have been held with Jim McGill, the Synod’s “water man” about the best option which may be to build a shallow, protected well. It would be good if the water could also be used for irrigation through, for instance, a windmill system. Another remote community in the Henga Valley has been given money to purchase 2 bullocks and ploughs. They would also like to have a cart and are currently investigating the cost of this. Again the community are all working together in this project. The main activity will be working with Alan Laverock’s work group who will undertake the refurbishment of Mlowe Clinic, renew roofs on orphan houses, build a house for 4 orphans at Machewre and repair an old mission house at Livingstonia which is home to 2 hsopital staff and their families. This brief report could not finish without a word of thanks to Bob Baxter and his wife Jan who have now returned to the UK. Bob was able to do much of the preparation for the Raven Trust’s work this summer and it has been great to work with him on his projects. A real partnership exists with Jan’s experience in education being very positive in developing educational links. The Trust, in turn, supports them in providing shipping facilities for school materials and other resources.